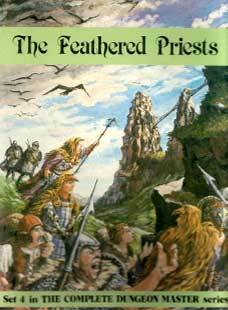 Michael Moorcock was de rigeur reading amongst my fellow roleplayers and the Elric Saga particularly so. Elric was for most readers the first true anti-hero and introduced the concept of exploiting flawed and troubled character possibilities in roleplay. My fondest memories were of my school mates and I swapping the London Panther editions in the playground like kids do today with XBox games. 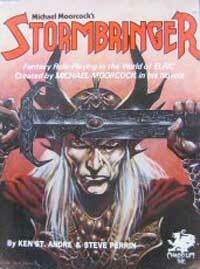 Elric of Melniboné (1972) - Where Elric, the 428th Sorceror Emperor of Melniboné and he discovers the runeblade "Stormbringer" from which he derives power and vitality. 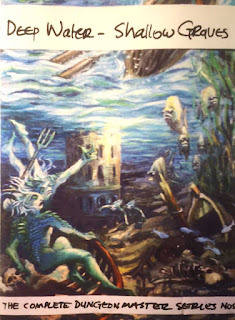 The Sailor on the Seas of Fate (1976) - Forced to flee Melniboné, Elric journeys across the sea and learns his fate, to become the Eternal Champion. 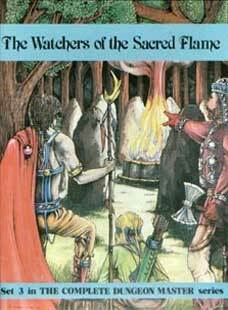 The Weird of the White Wolf (1977) - Where Elric returns to Melniboné with his companion Moonglum and confronts the usurper Yrkoon. Stormbringer (1965) - Elric must confront the Sorceror King of Pan Tang Jagren Lern who has allied himself with the Lords of Chaos in an epic final battle. Elric is one of the many incarnations of The Eternal Champion, a hero who exists in all times, universes and dimensions who is charged by Fate to defend the cosmic balance between the gods of Law and Chaos. With all this rich source material and an established fan base it was an obvious move to publish an RPG based on the books, which Chaosium promptly did in 1981 with the release of Stormbringer. 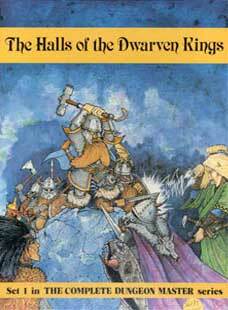 This then led to a small (in relative terms) collection of sourcebooks, modules and expansions. When Games Workshop began distributing Stormbringer for Chaosium one of the first things they did was to make a set of miniatures. 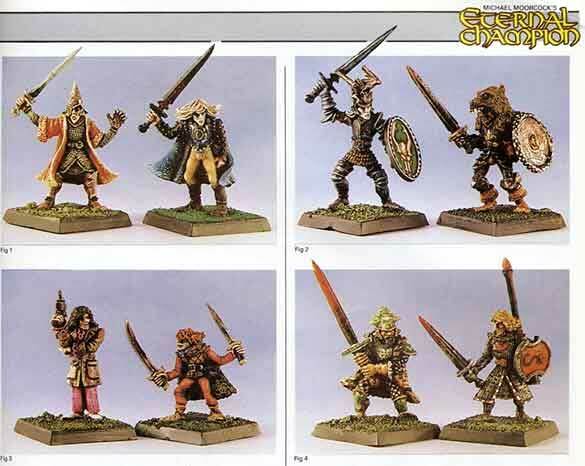 The Eternal Champion range was quite extensive and, beyond the boxed set of hero characters, featured Melnibonéan infantry and cavalry and Pan Tangian infantry, and tiger handlers. Michael Moorcock was heavily involved in the London psychedelic scene in the 1960s and he has explored many musical projects and has colaborated with several bands including Blue Oyster Cult and most notably space rockers Hawkwind. 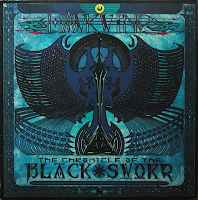 This lead to the album "Chronicles of the Black Sword" based largely on the Elric Saga, the notable exception being the track "Needle Gun" which is based on Jerry Cornelius another work by Moorcock and another incarnation of The Eternal Champion. This type of map is mostly for use during play (with or without miniatures) and often uses the 1" to 5' scale convention. 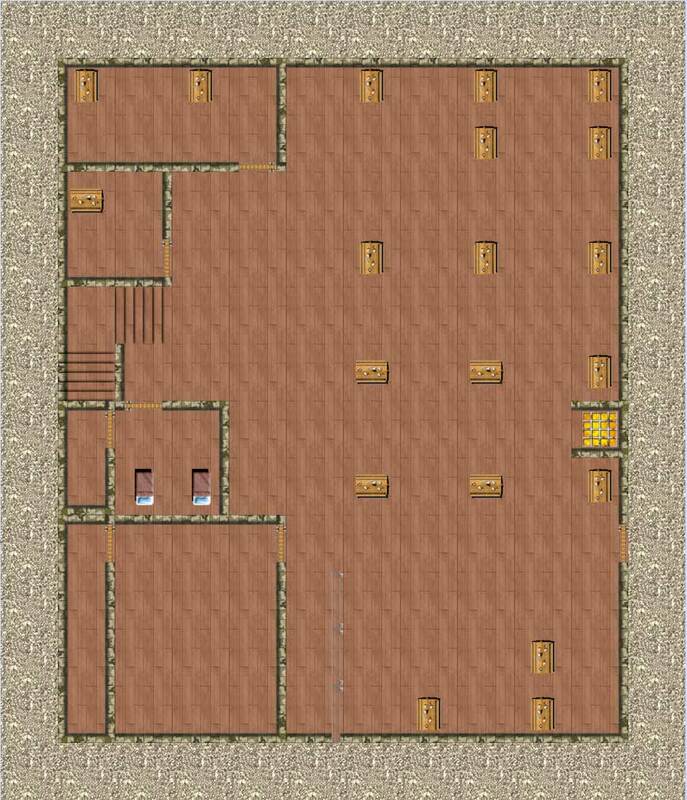 To test the output of each of the maps I used Inkwell Ideas Random Inn Generator to build a simple one storey building which I would then build in each of the mapping tools trying to stay as close to the original as possible and include as many items of decor as possible. 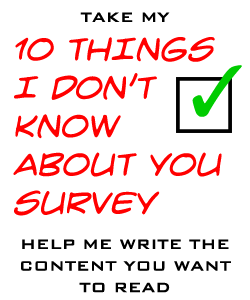 I restricted myself to free tools available to either download or use in a web app interface and limited myself to around 1½ hours time in order to learn the interface and build the map. 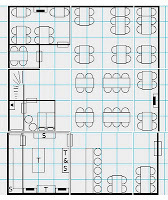 A free web app tile based editor which appears to be either a hobby project or a technical exercise. 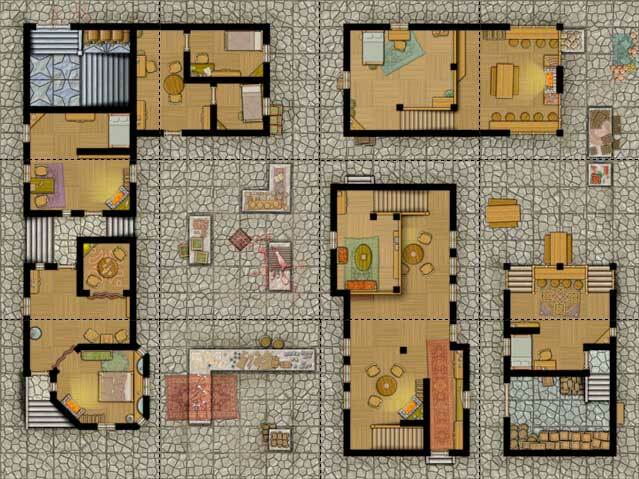 Limited functionality with only 4 layers per grid square (Floor, Walls, Objects, Special. Limited default tiles reduce its usefulness, but if you are in need of a quick map it has no learning curve at all and a reasonable output. 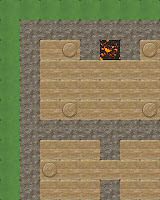 One word of warning though, make sure that you keep your plan entirely inside the editor frame otherwise you will have difficulty exporting the result as there are no save or export functions - 5/10 " Simple, perhaps too simple"
A free web app tile based editor, this one has a much better interface and more tiles are available in the default set. The learning curve is a little steeper but the results are exponentially better. Still has the feel of an unfinished project about it as some tile sets don't appear to be populated (wooden floors and roofs). The export to jpg/png and export to pdf functions don't appear to work, but it is possible to upload to a server (which generates a png) and then use URL to access the png for saving to a local drive. 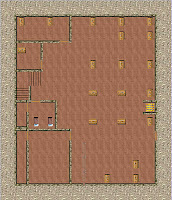 There are other tilesets which can be used depending on the genre of game you're mapping for and your artistic tastes. All in all a great little tool which sets the bar for me. 8/10 "Very useable"
Although it is not possible to buy Dunjinni (the online store remains closed until further notice) it is possible to use the free demo version to knock out a quick map. This can then be further embellished by adding in any items in a bitmap editing tool which you can find in either the Dundjinni forums or in the CSUAC (User Art Collection) available from www.halegaming.com. Unfortunately the demo app has the Save and Export functions disabled so you may have to resort to screen capture (as I did). 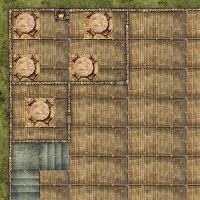 7/10 "Still worth trying"
Fans of Ed Bourelle's Skeleton Key Games map tiles can use TIAMAT which is a tile layout web application. 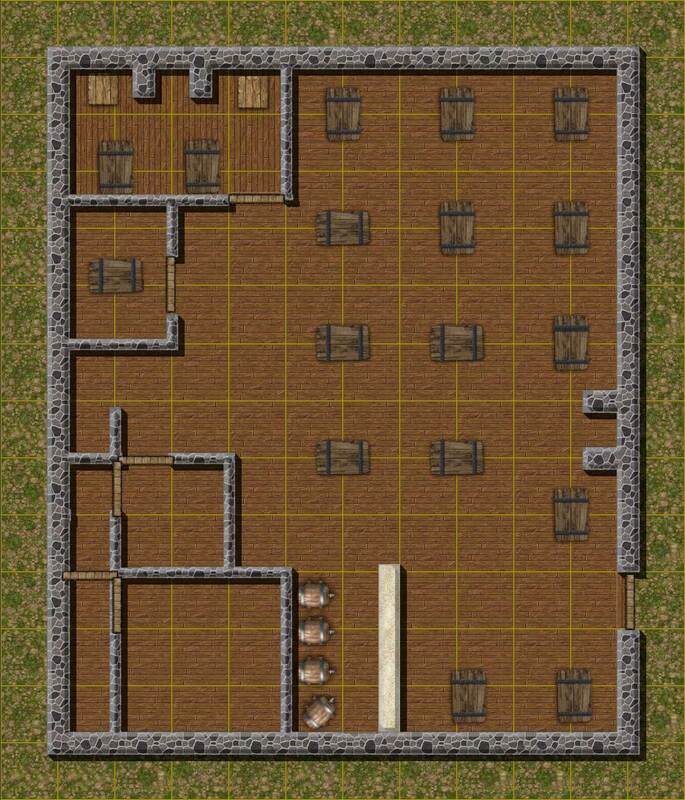 Obviously I was unable to test the software with the sample tavern map I used with the other apps because there are no editing functions. 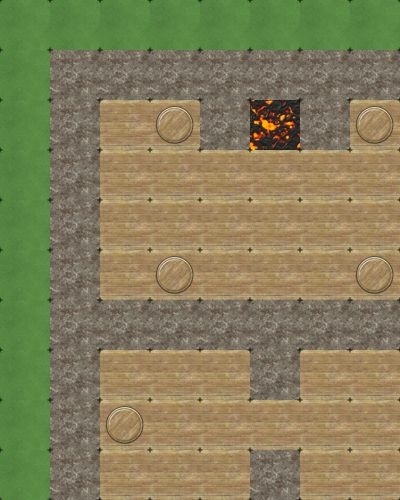 The map I made took literally 5 minutes to put together, but with 3,216 different tiles to choose from, you could easily spend hours pouring over the gorgeous tiles. Although the app is free to use, exporting them is done through the RPG Objects storefront, you will need to set up an account and each map export costs $2.00 (RPG Objects are giving away 1 free export a month as an incentive). 8/10 "So many tile options..."
This free web application is limited to an 8x10 grid and has a very limited tile set and you can only only uses 3 layers per square. Once you've set up an account you can add your own tiles, but there is a submission and approval process so it's not instantaneous. Development seems to have stalled at the moment and I hope that the coders pick up work again soon as this is a veery noble effort and I really like the clean no nonsense interface. 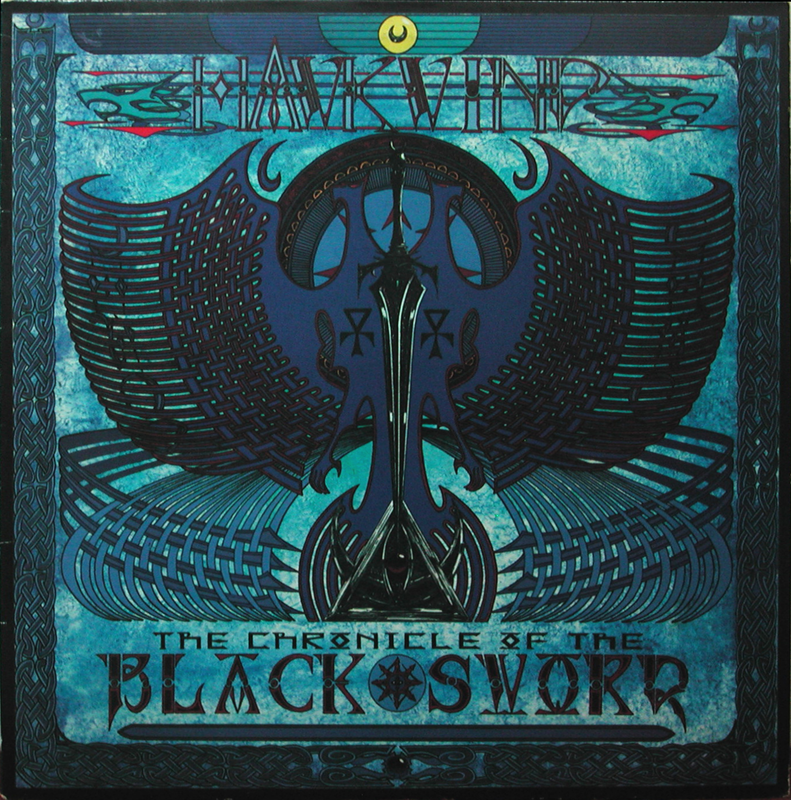 4/10 "I will follow your progress closely young Jedi"
This is a free Windows application (and alledgedly Mac OSX and Linux using a Python interpreter) and is like a cross between TIAMAT and Dungeon Painter/Dunjinni. 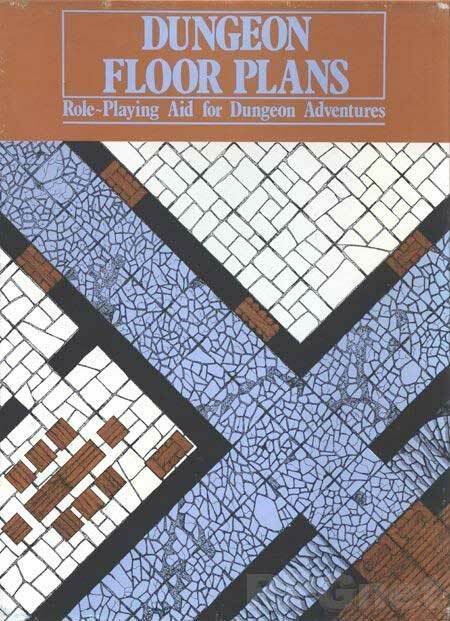 It's predominantly a tile layout system for use with the WotC D&D tiles, the idea being that you can build a library of the tiles you have and then design using only those tiles. The tiles are double sided and therefore you sometimes have to choose between one side or the other. Fortunately there is an "unlimited" mode which allows you to use multiple copies of the same tile. The interface is slow and a little clumsy as the tiles often don't snap to where you've dragged them, but it's better than nothing. 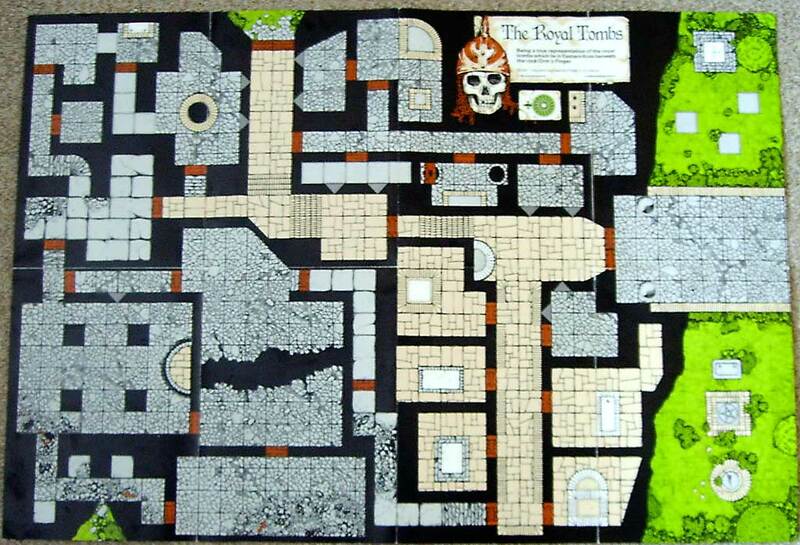 The tiles themselves are quite low res scans of the original and I'm not sure how good they'd look when printed out. 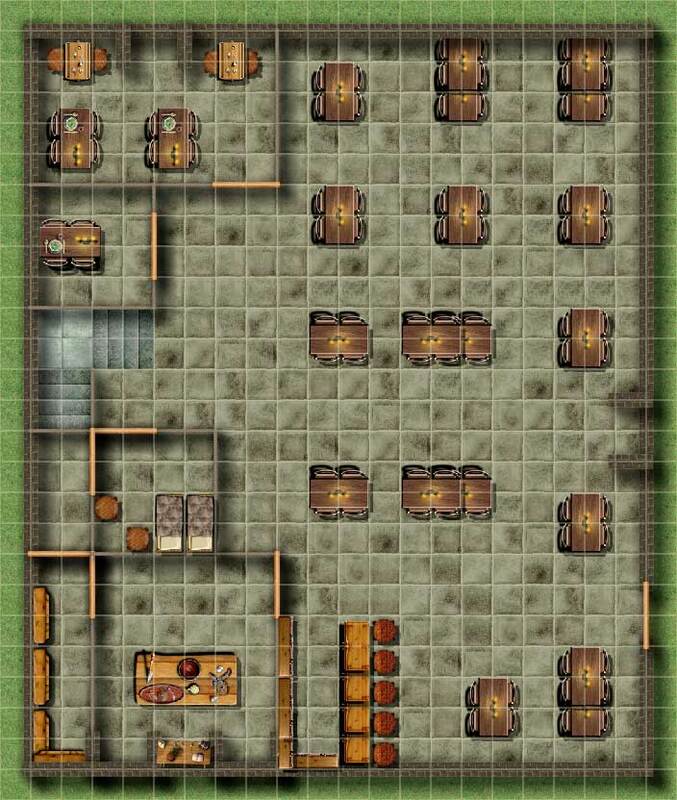 One big issue is that the tiles do not include any transparent "objects" like tables or chairs so if you want to dress your battlemap beyond the WotC offerings you are still going to have to hunt down the images in the CSUAC or in the Dunjinni forums. 6/10 "Almost a real contender"
Apologies if I've missed out any other tools, or if you know of any you want me to try out, just drop me a comment below. Endless Plans (Endless Games 1983-?) 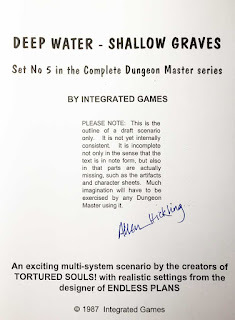 - Not much info has survived about these other than that they were mostly two colour plans and were also featured in The Complete Dungeon Master series of boxed sets and Tortured Souls magazine. There were at least 8 sets, with Set 8 being Forests, and they were very architectural in design. As I recall you were meant to cut them out along the dotted lines and you could then build up quite intricate and irregular dungeons by layering pieces one on top of another. This approach was novel, but futile and unplayable unless you had access to plenty of magic tape and an A3 photocopier. 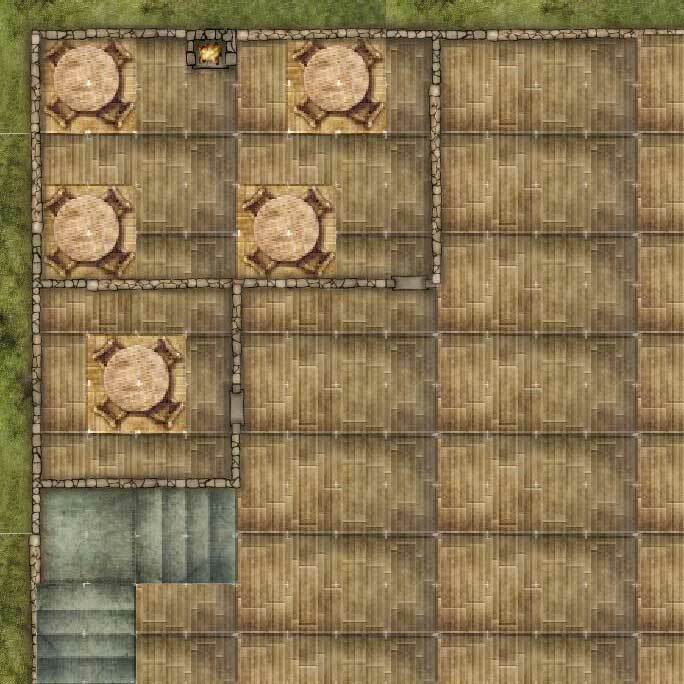 The wilderness tiles did have overlayed crosses for movement but they were far too intricate to be really useful (in comparison with the Dungeon Planner or Dungeon Floor Plans sets around at he same time. 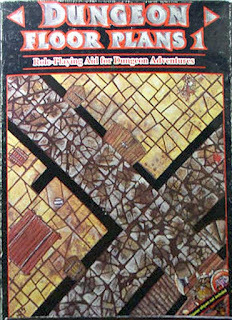 Dungeons & Dragons Dungeon Floor Plans (Games Workshop 1979) - Published by under license from TSR these are the granddaddy of all the Games Workshop floorplan sets and were reprinted in 1982 without any reference to the Dungeons and Dragons brand and also form the basis for the Dungeon Planner series reusing the same ground artwork. 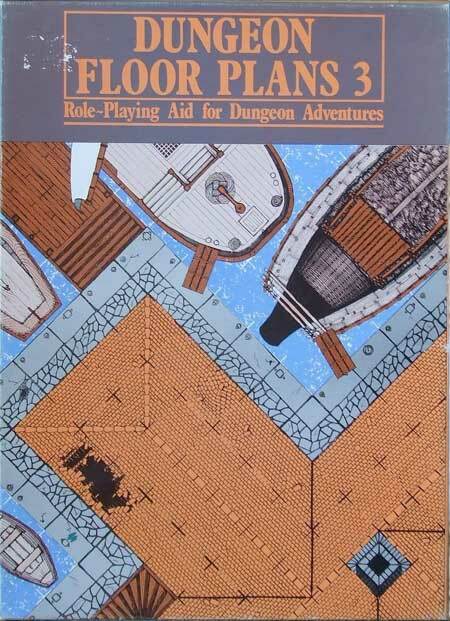 Dungeon Planner (Games Workshop) - Neither of these are the traditional type of floorplans. 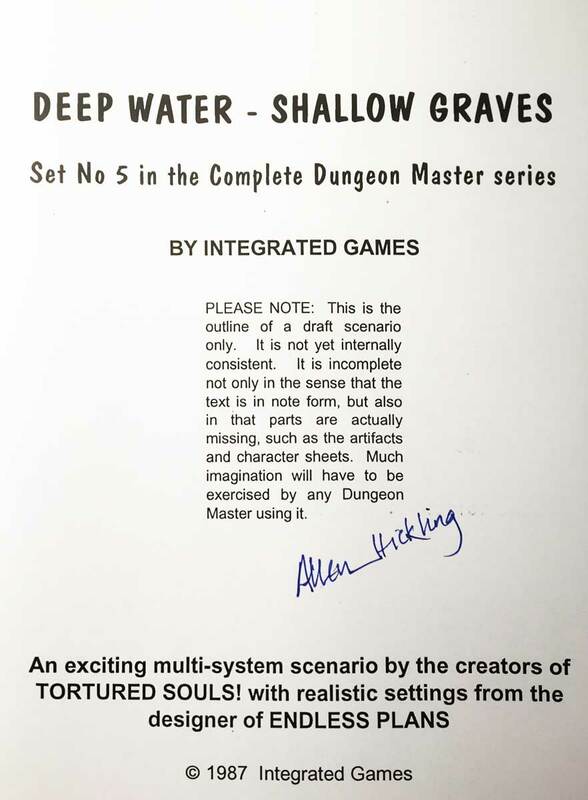 Each box set came with an A2 map of the area in question (1in to 5ft scale) and a booklet for the DM to write scenario specific information in blocks corresponding to the numbered locations. The covers of the booklets also doubled as a DM's screen containing Encounter Tables and a black and white DM's version of the map with the rooms and doors numbered. 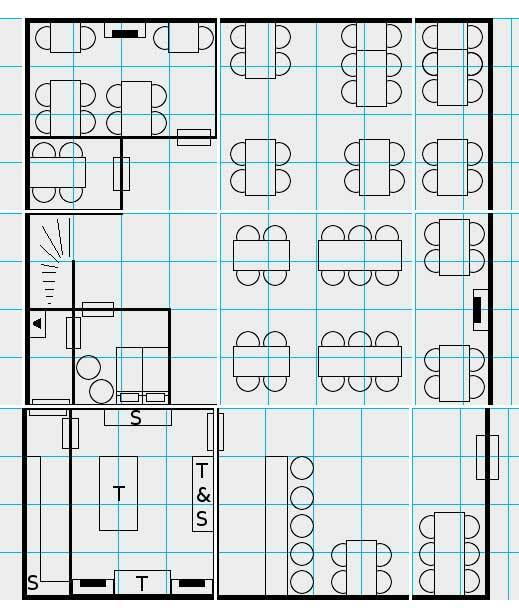 I particularly liked the fact that the doors were seperately numbered as it is irritating when running a commercial scenario to find the status of the doors in the last line (or worse buried in the middle) of the room description. Set 1: Caverns of the Dead (1984) - (Artist: Gary Chalk) - This map depicted a typical dungeon and came with an extra A4 map of the region of Koss. 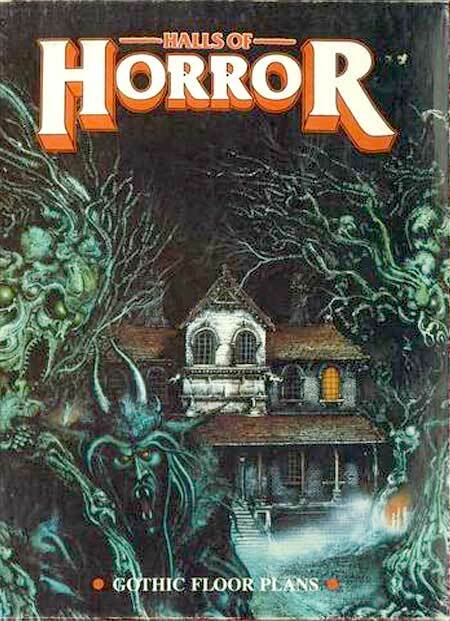 Set 2: Nightmare in Blackmarsh (1984) - (Artist: by Albie Fiore and Robert Neville) - This set was part of a waterside village called Blackmarsh. 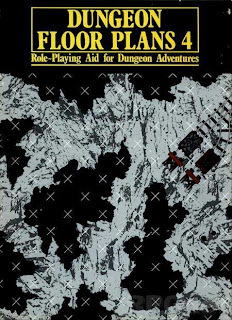 Dungeon Floor Plans (1982) - 12 Sheets of generic dungeon floors including; 4 sheets of grey "crazy paved" stone floor, 3 sheets of beige flagstone floors, 1 sheet of wooden floors and 1 sheet of stone steps. 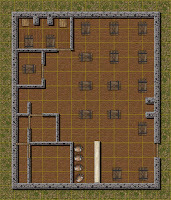 Dungeon Floor Plans 2 (1982) - 12 Sheets of exterior floors including; 3 sheets of grass, trees and Hedges, 3 sheets of water, 2 sheets of grey corridor features, 2 sheets of beige and 2 sheets of beige flagstone floors. Dungeon Floorplans 3 (1983) - 12 Sheets of exterior features including; 4 sheets of roof tiles, 2 sheets of roof junctions, 2 sheets of timber features, two sheets of boats and two sheets of stone/dirt features. 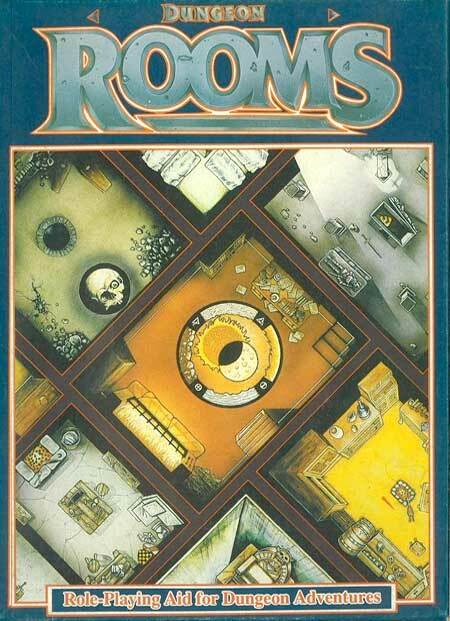 Dungeon Floorplans 4 (1984) - 12 coloured sheets including; 5 rocky cavern floor Three Tunnel and Cavern walls 2 sheets of junctions openings and corners, 1 sheet of Cave features and 1 sheet of mine rails, rail junctions and accessories such as wagons, wheelbarrows and buffers. 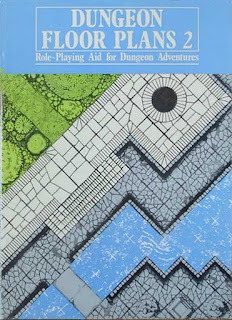 Dungeon Floor Plans 1 (1986) - (unknown artist) - A re-imagineering of the 1982 set with full colour artwork including doors and furniture. 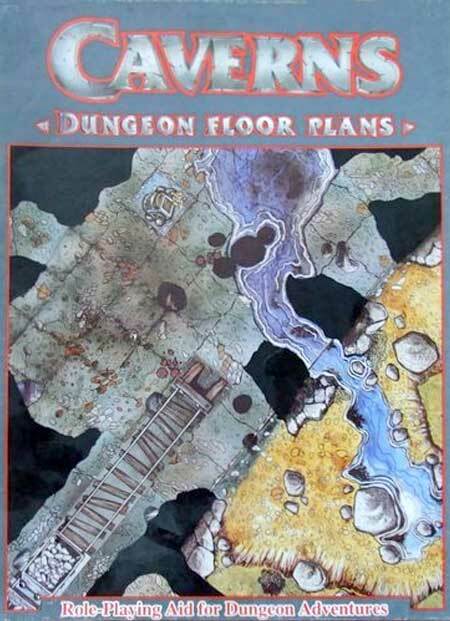 Dungeon Caverns (1986) - (Artist: Dave Andrews) - 12 Sheets of Caverns including 3 cavern floors, 1 cavern floor with stream, 3 curved cavern tunnels, 1 straight cavern tunnel with mine rails, 2 junctions 1 entrance and 1 sheet of cavern features such as steps, planks, treasure and weapons and a magma river. Dungeon Rooms (1986) - (Artists: Tony Ackland, Dave Andrews, Colin Dixon) - 12 sheets including 23 rooms: Torture Chamber, Necromancer's Study, Armoury, Temple, Bedroom, Mausoleum, Apothecary, Guardroom and Cell, Treasure Room, Throne Room, Alchemist's Laboratory, Orc's Den, Wizard's Study, Great Hall, Forge, Kitchen, Barracks, Mortuary, Gladiatorial Pit, Library, Large Stairwell, Magic Well, Dragon's Lair plus Corridors and Passageways. 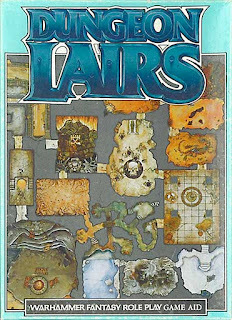 Dungeon Lairs (1987) - (Artists: Dave Andrews, Colin Dixon) - 10 sheets of monster lairs including: Sewers, Tunnel Complex, Troll Cave, Chaos Cavern, Chaos Temple, Ancient Temple, Barrow, Goblin Hall, Mossy Cave, Tree Root Cavern, Water Filled Cave, Ice Cavern Chaos Throne Room. 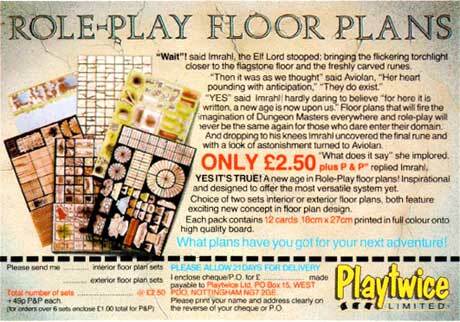 Role-Play Floor Plans (Playtwice Ltd) - I have one sheet (I have no idea when or where I acquired it) from one of the two sets published and they mimicked the Dungeon Floor Plans Set 1 but were slightly more colourful. No lighting effects were present but you did get a good spread of floor accessories as can be seen in this period advert from Adventurer Magazine. 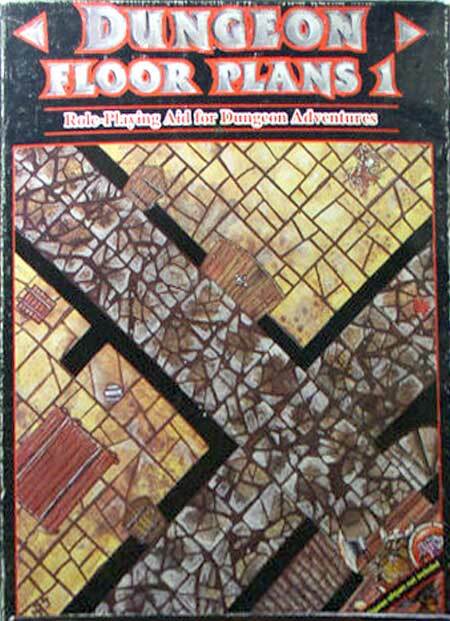 Heroquest (Games Workshop / MB Games 1989) - This boardgame featured a big full colour dungeon which although it has some unfavourable design characterstics it is still quite useable for smaller dungeons. 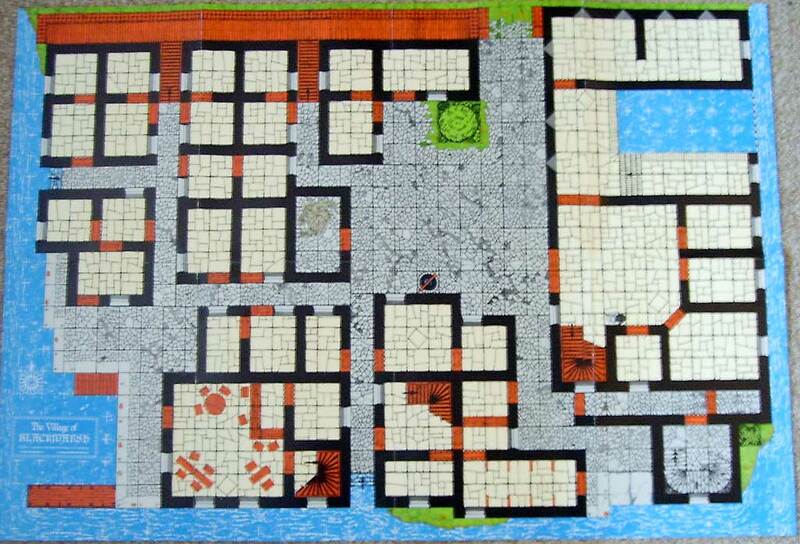 Advanced Heroquest (Games Workshop 1989) - Came with some really nice floorplans with jigsaw connectors so they didn't slide all over the place. Far nicer and more useable than the DUNGEON Floor Plans which GW released 3 years earlier. Judge Dredd: Slaughter Margin (Games Workshop 1986) - (Artist: Dave Andrews) - A campaign scenario boxset which included 8 A3 playsheets depicting scenes from the scenario but designed to be quite generic and 3 sheets of accessories like furniture and machinery. Judge Dredd: Citi-Block (Games Workshop 1987) - (Artist: Dave Andrews) - 8 A3 Floorplans representing an open area, park, entrance plaza, office units, helipad/hover bus stop, 2 pipeway/corridors, and sky-rail station and 4 A4 sheets of cardstock vehicles, street furniture and machinery to populate your own Mega City block. Fully compatible with the earlier Slaughter Margin and very useable for all manner of Sci-Fi games. I'm not going to recant the life story of this company, just tell you what it felt like from my perspective. In my early days as a gamer my dad took me along to wargames conventions in an around the north of England from the age of 5. Shows such as Northern Militaire, Sheffield Triples or Leeds Fiasco. 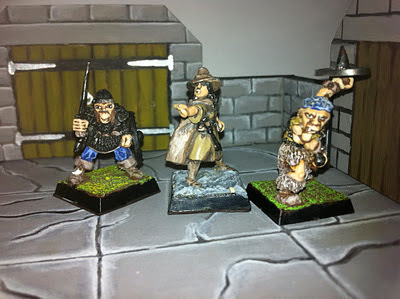 Roleplaying and Fantasy wargaming in general was often seen as the young punk of the wargaming scene, but it was very much part of the scene and not a seperate hobby. All the miniatures manufacturers were present so I got to see everything that was readily available. It wasn't particularly impressive to be honest. The miniatures hadn't really evolved from the primitive "tin soldier" sculpts of earlier decades. 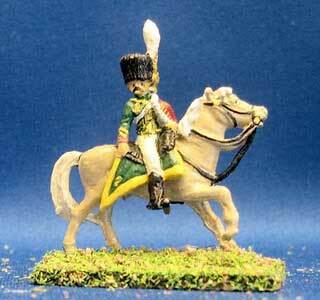 For many wargamers in the 70s, my Dad included, it was all about Napoleonics. 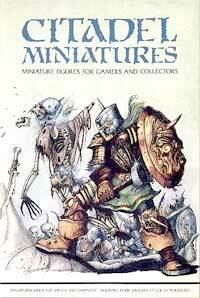 Large formations of miniatures which looked impressive due to their numbers and so they were sculpted to "stand off scale" quality. Yes you could see a nose and maybe an ear, but there was never any expression (or maybe that was cos they really were that stiff upper lipped back then). I ws never going to get excited about a featureless figure with no facial detail, this is my character I want to represent, he has to have a face!! Then along came Citadel Miniatures, they were sculpted with charisma, a lone barbarian facing off against the goblin horde had a facial expression, you could tell he was pretty angry. The poses were far more dynamic and they had musculature, it was almost like the before and after shots in a Mr Universe advert. Of couse this was the only encouragement I needed to beg some extra pocket money and start my collection with the Dungeon Adventurers Starter Pack. The early miniatures looked pretty primitive, by todays standards, and when in the Citadel launched it's slotta base ranges in the early 80s it was quite frankly a revolution. Gone were the mishappen lumps of solid lead at the bottom of each figure, which were never flat and which you had to file down (generating lots of lead dust) to make the mini stand up straight. Instead between its legs the mini had a strip of lead bearing the range number and the Citadel stamp of approval. An unintended consequence of this being that you can now easily identify any vintage miniature you pick up on ebay and prices of vintage miniatures particularly citadel have sky rocketed. My friends and I would drool over the Citadel Compendium and choosing a new miniature became a bit of a ritual as you scanned the contents of each page or jiggled the miniatures around in their "blister pack" to see if the one you wanted was in there. Advanced Dungeons & Dragons (ADD): The Player Character Packs featured 3 versions of the same AD&D class minis per blister pack. Designed to represent your character as it evolved through the levels you got a Low, Medium and High level version of each character, all sculpted by Aly Morrison. There were also Monster Packs with a varying number of minis all of the same race usually. There's a great photo archive of the AD&D range over at Stuff of Legends. Talisman: All the player characters from the original Talisman Boardgame were represented and were designed to replace the original card standees which came inside the gamebox, and came with distinctive hex bases. 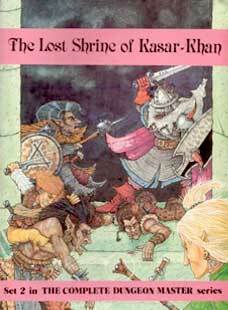 As further Talisman supplements were released the range expanded to include the characters from Expansion, Adventure, Dungeon and Timescape. 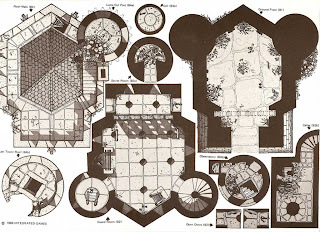 Gothic Horror: For players of Call of Cthulhu, Citadel released this range even though at the time they did not hold the license for CoC minis, they did distribute CoC in the UK for Chaosium and later created the Halls of Horror floorplans to expanding their Dungeon Floors range of cardstock floorplans. Citadel quite literally broke the mould and pretty soon other mini companies started to smell the coffee. Wargamers demanded better quality sculpts and new manufacturers were started up, some by the Citadel sculptors themselves, those that didn't redesign their lines just faded into obscurity. Released in 1991, the set consisted of a 10" square felt backed metal board with 1" square stone tiles printed on it's face. The plastic walls and doors had a rectangular recess in the base to house a strip of magnetic plastic, a sort of thick version of that used in magnetic sign boards. The corners of each wall section were mitred at 45 degrees so you could make convincing corners and but walls together to make corridors. Door archways were also included in the set, but there were no doors themselves. 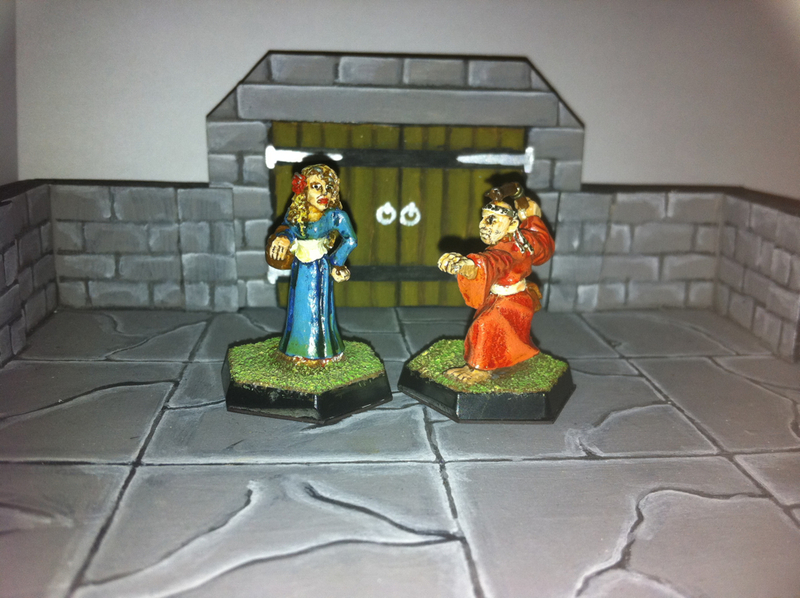 As you can see I added some resin cast doors to a few of the walls in my set. There was one huge problem with the whole set which I found almost immediately during play. The walls are way too high and the board too small. 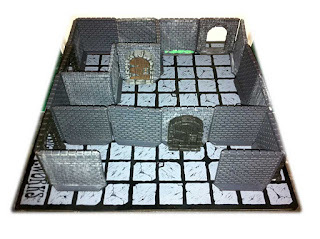 In fact my experiences with this set were partly behind my reasons to go with a 1.5" square floorplan scale and 1" hinch walls in my foamcard 3D dungeon, a winning combination in my opinion. The miniatures end up being crammed into a tiny area and the board can only handle a maximum room size of 50'x50'. I guess they were expecting you to buy more than one set, but it was too heavy to carry around compared with a box of cardstock floorplans, not to mention the price. 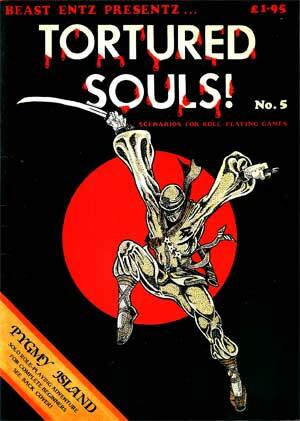 Publishers of Tortured Souls! magazine from 1983 to 1986 which was a scenarios only title in the same vein as Dungeon but pre-dating it by a whole 3 years!. 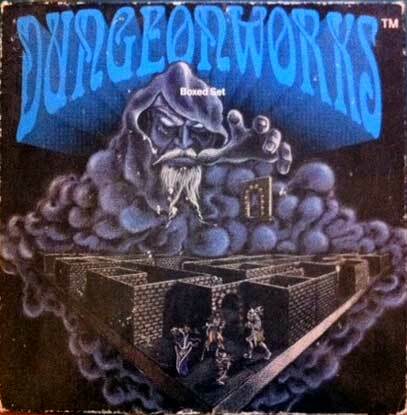 It's primary focus was of course D&D / AD&D and specifically the Zhalindor campaign, but there was always an attempt to reach out to the Runequest DM so stat blocks also featured RQ conversions. Endless Games - Produced A range of very detailed architectural floor plans known as Endless Plans, drawn by Allen and Brendan Hickling which featured in all of the Integrated Games products and Tortured Souls! issues. This mutually beneficial arrangement (from a GMs perspective) is much like that of Ptolus where Monte Cook teamed up with Ed Bourelle (Skeleton Key Games) to produce high quality campaign material with equally high quality floorplans. TM Games - Manufactured (in partnership with Endless Games) a range of accessories such as the A4 character record pad and the ever useful hex map pad. Looking back at Tortured Souls! I find it odd that the scenarios were never credited to anyone. They were always well constructed although they shared the same densely packed san-serif typography which was to be frank a little tireing on the eye. The covers always stood out in a minimalist kind of way being almost exclusively black with a single illustration in the center. 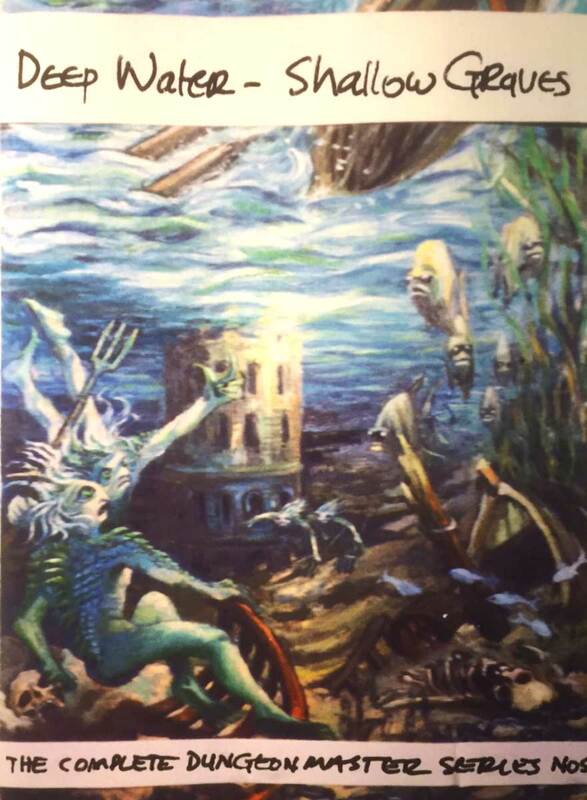 Interior art was supplied by Paul Ward and Jon Baker, who also supplied interior artwork for the CDM series and both had very distingtive styles. 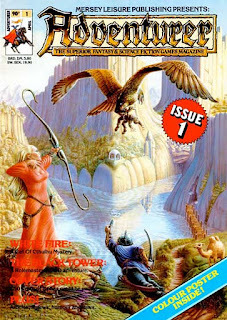 Adventurer was the first of the "independent" roleplaying magazines that made it out of specialist stores (in the US read FLGs) and into the High Street newsagents like John Menzies and W H Smiths. Published by the liverpool based Mersey Leisure Publications and ran for a total of 11 issues between April 1986 and July 1987, it appeared in the wake of TSR UK's IMAGINE magazine which had closed the previous year. It was put together by a small team on a small budget and the quality of the interior artwork sometimes suffered as a result, but that was always made up for by the glossy full-colour front covers. 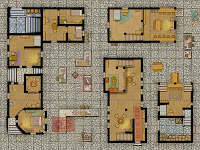 White Fire (Uncredited) - A Call of Cthulhu scenario featuring an amazingly detailed cut-a-way illustration of the mansion which was the main location. 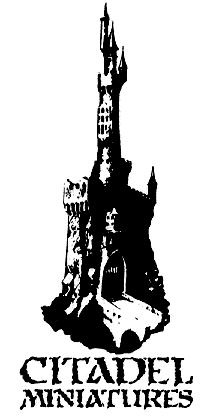 How to become a Method Role-player (Steve Rawlinson) - An article discussing approaches to method acting in RPGs. Gumshoe (Peter England) - A preview of the detective RPG of the same name set in the "gangster-ridden" streets of 1930's Chicago. I've never played Gumshoe, but it was released by Sleuth Publications who were also responsible for the bookcase boardgame Sherlock Holmes Consulting Detective which is well worth picking up if you can get it as it is the closest you'll ever come to a Boardgame / RPG crossover. A review of the First British Play By Mail (PBM) Convention - The concept of PBM (ie: posting off your turn every week (including the small fee) to the GM for them to send you back a letter telling you how it went) seems so quaint looking back from this high-speed broadband always on mobile internet world that we live in, but it was the great granddaddy of the MMORPG, just done via snail mail. Psychology in Games (Stephen Dillon) - A Roleplaying Theory article explaining the basic concepts of Psychology (ie: Motivation and Personality) and how they manifests themselves during play in PC and NPC interaction. Padding anyone? Blood Loss (Paul Evans) - An article which offers an alternative way to describe damage to characters (particularly those high level characters with 50+ HP). Death by a thousand cuts anyone? Figures Front (Martyn Tetlow and Will Hannah) - doing a reasonable job at reviewing new miniatures and featuring a page of full colour painted miniatures although the photography and printing were pretty grim by todays standards. Live By The Sword - The defacto "letters page" including a letter requesting submission guidelines from Marcus L Rowland who was a contributor to White Dwarf and has since gone on to create supplements for GDW's Space 1889, Call of Cthulhu and his own RPGs Diana Warrior Princess, Flatland and Forgotten Futures. Town Crier - A news section discussing products in development and new releases. Once Bitten - A regular comic strip with artwork clearly inspired by the work of underground comic artist Robert Crumb. 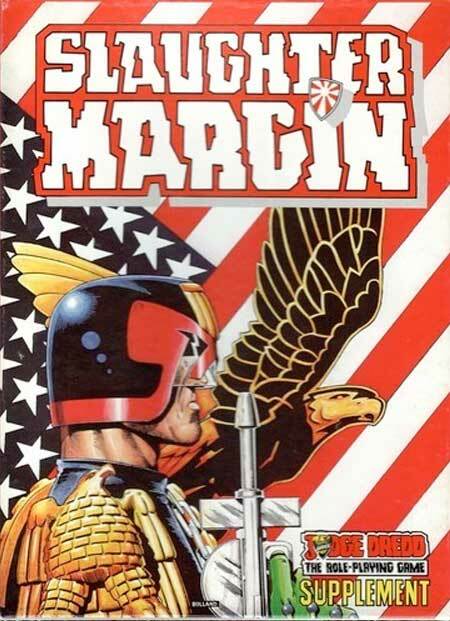 Editor: Stephen "Ste" Dillon - Is this the same Steve Dillon who has since gone on to be a celebrated comicbook writer? you decide (see inset pics). 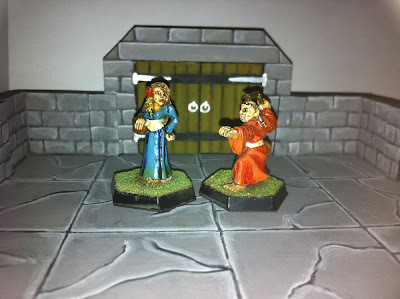 Miniatures Reviews - Martyn Tetlow and Miniature Painting Tips - Will Hannah. Artists: Robin Parry (who created the cover for issue 1) and George Jones. When I could get hold of a copy I would pour through it avidly as it had a certain homebrew appeal and was pitched at a slightly maturer reader. 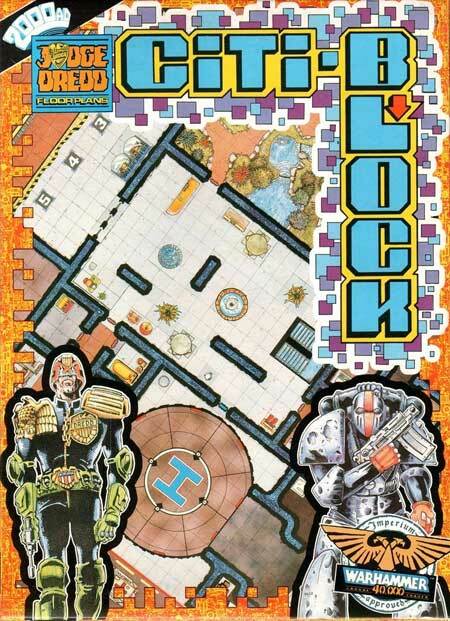 This was at a time when the other dominant force in the UK RPG (Games Workshop's White Dwarf) was still publishing RPG material for CoC, Golden Heroes and my favourite Judge Dredd and it had yet to morph into the Warhammer brochure that it is today. I've since discovered that they're all available online via mediafire, if anyone else would like a slice of RPG nostalgia along with their cup of tea. 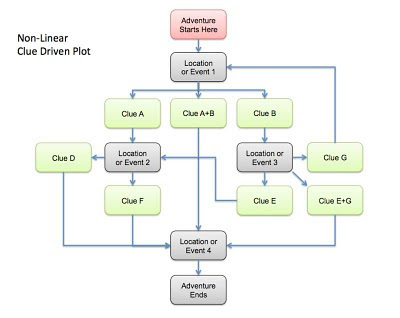 Although the example is deliberately simple it demonstrates how taking this approach can and does prepare you for almost any eventuality and may even reap rewards in the design stage by focusing your writing (in a similar way to a mind map) and offer other plot possibilities that you hadn't thought of initially. Why does the patron want the artifact? Can it be used to control the Evil? Was the patron behind the event which threatened the PCs life? 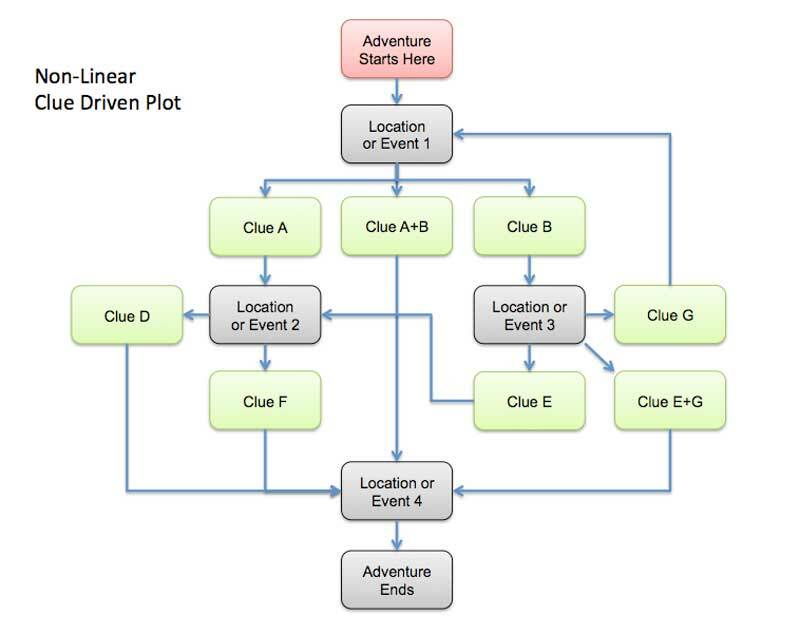 Again the deliberately simple diagram above only details Two Clues per node and I cannot reccomend enough the importance of following The Three Clue Rule lest your scenario grind to a halt in a choke point. 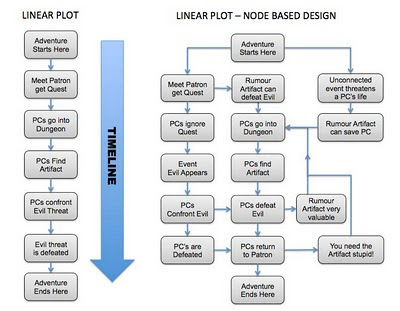 However, as you can see, the PCs may take any route through the scenario they choose and you will have already done the hard work of designing each node in advance and be prepared for most eventualities. 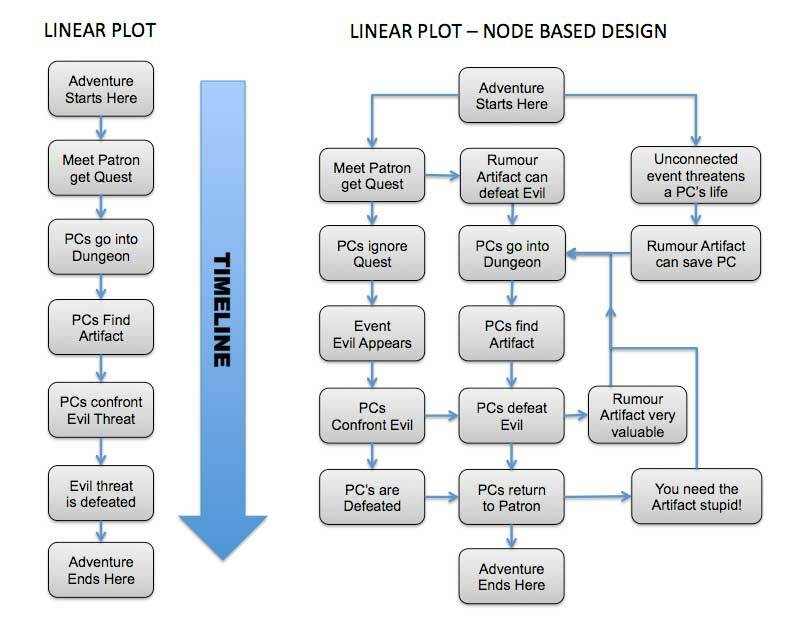 As Justin quite rightly points out these do not have to necessarily be clues, they can be events, objects or rumours which PUSH players into moving to the the next node or equally their desires can PULL them in a particular direction. It's quite fun to watch your players sweat over equally enticing possibilities or for them to choose what they think is the easy option only for it to turn nasty. The Hobbit (JRR Tolkien) - Despite her reticence to read my dogeared and yellowed 1973 copy which was handed down from Father to Son many moons ago (the book is one year younger than I am). By the time you read this we will be over half way through and I think she's secretly enjoying it (but trying not to show it). Of course I couldn't help myself but to put on a good Andy Serkis voice whilst reading the part of Gollum. Plague 99 (Jean Ure) - I know absolutely nothing about this book and am quite worried that other books by her have titles like "Girlfriends: Pink Knicker's aren't Cool" or "Frankie Foster Freaks Out!" The Mortal Engines Quartet (Phillip Reeve) - I've been waiting for a good excuse to read these. I've been lusting after the Dystopian Wars miniatures from Spartan Games which appear to be inspired by them. The Windsinger (William Nicholson) - From what I can glean from the internet this looks like a run of the mill fantasy trilogy. We may have to pass on this as I'd really like to get her opinion on Trudi Canavan's Black Magician Trilogy. The Chrysalids (John Wyndham) - Can't wait to read this with her. She really enjoyed the BBC2 version of The Day of the Triffids. Harry Potter (Series) - J K Rowling - She's expressed a strong dislike of Mr Potter, so we're going to have to skip these (which I'm rather glad about as I think they're purile derivative nonsense as well). The Hunger Games (Suzanne Collins) - I know nothing aboout this book other than that it is being made into a movie slated for a 2012 release starring Jennifer Lawrence (who played Mystique in X-Men First Class). It's IMDB summary is "A young girl volunteers to take her sister's place in a fight to the death in a dystopian future" so sounds promising then. I am Number Four (Pittacus Lore) - We really enjoyed the movie and I suspect that the book is a lot better. Heidi (Johanna Spyri) - I used to love watching this on TV as a kid. Lord of the Flies (William Golding) - This is a must read. The Princess Diaries (Meg Cabot) - Got to read this.